Tuesday's News On The Crisis In Japan : The Two-Way Tuesday's developments in Japan, where cities and towns along parts of the eastern coast were devastated by a 9.0-magnitude earthquake and then a tsunami on March 11. 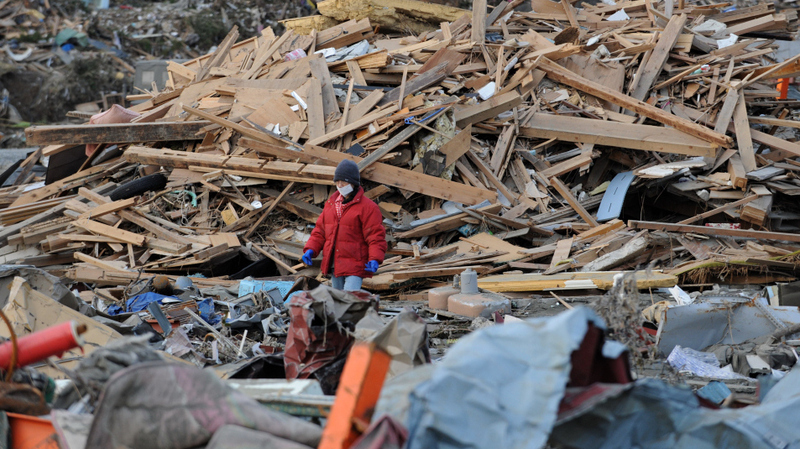 Earlier today in Minamisanriku, Miyagi prefecture, a woman walked through rubble. Update at 6:54 p.m. ET. We're going to pause our live blog here. We'll be back tomorrow morning with the latest. "Dozens of residents near Japan's stricken nuclear plant have told The Associated Press they never received any information about how to avoid the threat of radiation after a nuclear accident," the wire service says. "Japan is famous for drilling its citizens on how to prepare for natural disasters. But it has done far less to prepare those who live near its many nuclear reactors for emergencies." "A vice president of the Tokyo Electric Power Company has apologized to local residents who were forced to evacuate their homes near the Fukushima Daiichi nuclear power plant," NHK reports. "On Tuesday, Norio Tsuzumi made his first visit to an emergency shelter in Tamura City, where about 800 evacuees from Okuma town are staying." At the crippled Fukushima Dai-Ichi nuclear power plant today, The Associated Press says, "emergency crews dumped 18 tons of seawater into a nearly boiling storage pool holding spent nuclear fuel, cooling it to 105 degrees Fahrenheit Japan's nuclear safety agency said." "As a fuel shortage has made cremation difficult, two municipalities in Miyagi Prefecture — Higashimatsushima and Watari — started burying identified bodies without cremation, an unusual move in Japan, after gaining consent from their families," Kyodo News reports. "Nine other municipalities in Miyagi as well as Kamaishi and Otsuchi, Iwate Prefecture, will follow suit." Our colleague JJ Sutherland walked through the town of Kesennuma, where the devastation is almost impossible to believe. His story is here. Kyodo News writes that "All six reactors at the quake-stricken Fukushima Daiichi nuclear power plant were reconnected to external power, plant operator Tokyo Electric Power Co. said Tuesday, although smoke detected at the No. 2 and No. 3 reactors the day before had temporarily hampered efforts to restore power and cool down spent nuclear fuel pools. ... Regaining power supply is needed for the restoration of equipment such as a ventilation system to filter radioactive substances from the air and some measuring tools in the control room, as well as to eventually restore the reactors' key cooling functions that were lost in the quake and ensuing tsunami." -- Death Toll. Kyodo News reports that "number of those who were killed or remain unaccounted for following the devastating March 11 earthquake and tsunami in Japan topped 22,000 on Tuesday, the National Police Agency said." -- Nuclear Plant. "Smoke and steam rose from two of the most threatening reactors at Japan's quake-crippled nuclear plant on Tuesday," Reuters writes, "suggesting the battle to avert a disastrous meltdown and stop the spread of radiation was far from won." The Associated Press adds that "the temperature in a spent fuel pool rises to near boiling, risking the release of radioactive steam and the explosion or melting of the rods." Meanwhile, The Wall Street Journal says that "work to restore power to reactors at the quake-hit Fukushima Daiichi nuclear power station resumed Tuesday morning, despite signs of smoke rising from reactors No. 2 and 3. -- Some Good News? As for the radiation that's been detected near the crippled Fukushima Dai-Ichi nuclear power plant, NPR's Richard Harris reported on Morning Edition that most of the material released so far is an isotope that decays quickly and could be gone relatively soon. "Taylor was a cheerful and enthusiastic student who, from her very earliest days at Randolph-Macon [College], had a dream to teach English in Japan," said Todd Munson, an associate professor of Asian studies at R-MC. "I am comforted by the knowledge that she was able to achieve that dream, even if the remainder of her life was cut so short."